Just because we’re trying our best to stay healthy, doesn’t mean we can’t add a little bit of fun to our diet. There are a lot of irresistible vegan desserts recipes available out there, and I’ve compiled a few of the best recipes I could find. 1. Remove the pits from the Medjool dates and soak them in warm water for 10 minutes. Drain the water from the dates and place in a food processor along with the remaining ingredients. Process until the nuts are crumbled and the crust is sticking together on it’s own. 1. Drain cashews from the soaking water and rinse under fresh water. Then add them to a high-speed blender or Vitamix along with frozen strawberries, agave nectar, melted coconut oil, and lemon juice. Blend until smooth. 1. Allow these strawberries to melt at room temperature or heat over low heat in a sauce pan for a few minutes until soft. Then blend this in a blender into a smooth purée. 3. Freeze the cheesecakes for 1-2 hours until solid. 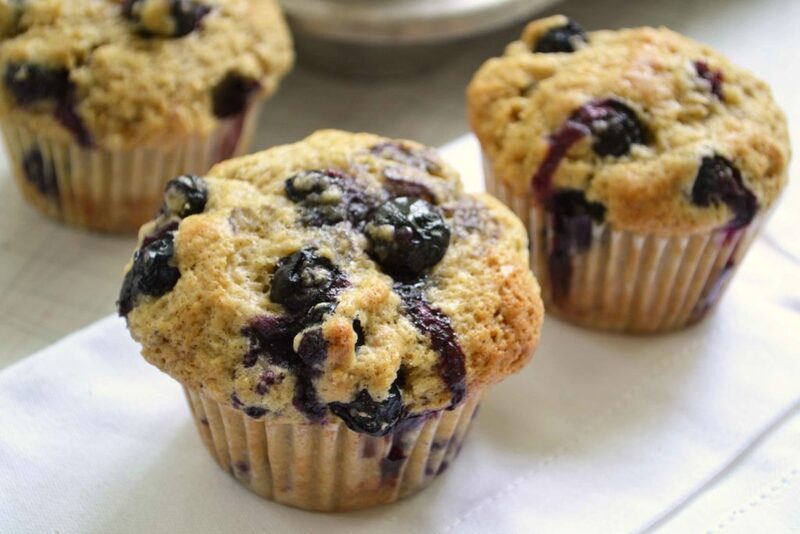 Remove them from the mini muffin trays and allow to thaw for 10-15 minutes. before biting into them. 1. Preheat oven to 375°F and line a mini cupcake tin with paper cups. 2. Mix wet ingredients together in large bowl, then stir in dry ingredients, followed by the blueberries. 3. Using small spoons, divide the batter among the cups so they’re almost filled to the top. 4. Bake until muffins are golden brown, for about 20 minutes. 1. 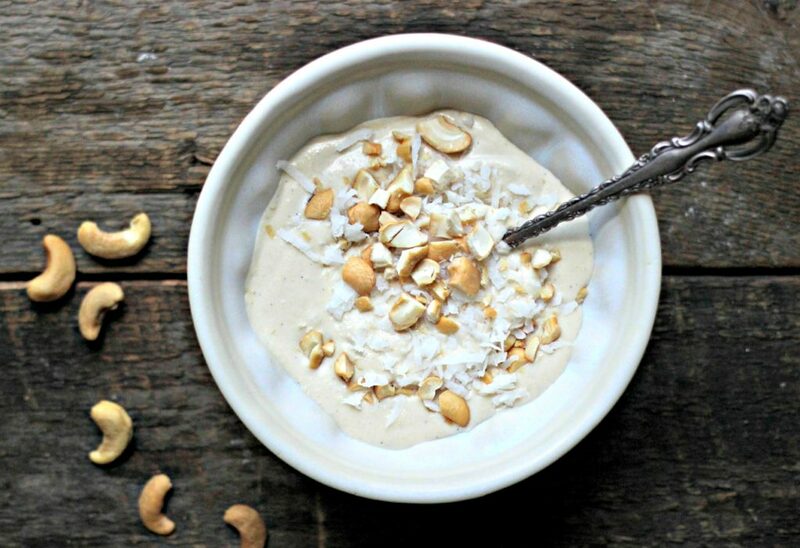 Put the cashews in a blender or food processor with 1 cup of water and puree until smooth (you will not have to strain this). 2. Place the cashew milk, coconut milk, rice, sugar and lime zest in a medium saucepot and whisk while bringing it up to a simmer over medium heat. Cover loosely and continue to simmer gently, stirring often, until the rice is tender, about 25 minutes. Remove the pot from the heat and stir in the vanilla. Cool the pudding to room temperature and then chill before serving. 3. Serve the pudding garnished with fresh berries, coconut shavings and/or toasted cashews. 1. In a food processor, combine coconut flour, pumpkin pie mix, dates, peanut butter, vanilla powder and sea salt until it forms a ball of dough. 2. With your hands, roll balls approximately 1 ¼” in size and poke truffle pop sticks into each ball. Set them on a dish or baking sheet lined with parchment paper while you melt the chocolate coating. 3. Melt chocolate chips with coconut oil in a double boiler or mixing bowl over a pot filled with a small amount of boiling water. 4. Stir until just melted and smooth, and remove from heat. 5. Dip the truffle pops in the melted chocolate and swirl to coat evenly. Use a spoon to get chocolate coating near the base of the ball. Allow excess to drip off before standing them upright. 6. Sprinkle coconut and/or pecans all over the chocolate, and using a piece of Styrofoam, place the truffle pop sticks in the 7. Styrofoam to stand upright in the fridge. 8. Refrigerate for at least 30 minutes to let the chocolate set. 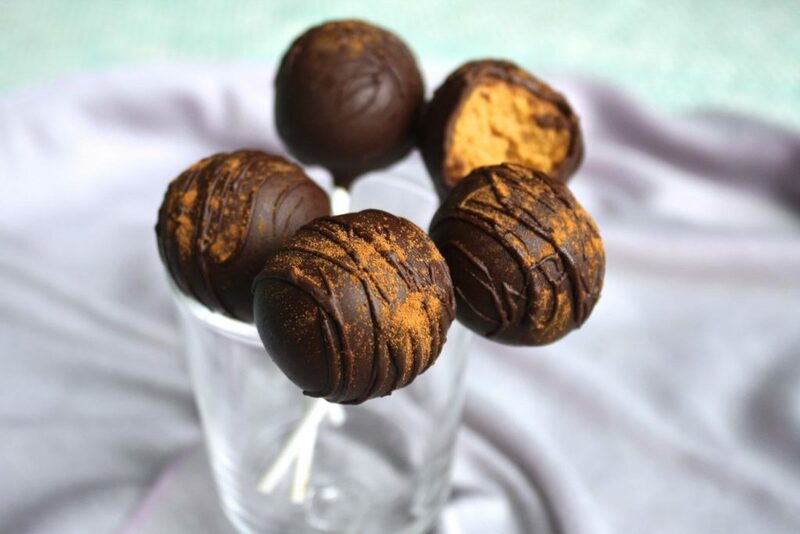 Keep truffle pops in the fridge until serving. 1. Combine active dry yeast with warm water and sugar. The water needs to be at a temperature of around 100°F for the yeast to activate, so it’s best to use a thermometer. Allow the mixture to sit for 10 minutes. It should double in size and be foamy at the top. 2. Meanwhile, melt your coconut oil over low heat. Ensure the coconut oil is also not heated above 100°F. 3. Combine flour with sea salt in a large mixing bowl. Then, create a well in the middle of the flour and pour the yeast mixture and the coconut oil into it. 4. Fold the dough gently to combine. It should just come together and then you can use your hands to knead it a few times to form a ball. 5. Lightly oil another large mixing bowl with 1 tsp of coconut oil and place the ball of dough in it to proof. Cover with plastic wrap and a towel, and leave it in a warm dark place for 2 hours. On top of the fridge or in the oven or microwave should be enough to keep any cool draft off of it. The dough will double in size. 6. While the dough is rising, you can prepare the spiced peaches. In a saucepan, heat spiced whiskey, maple syrup and diced peaches over medium heat. Simmer for 15 minutes, stirring occasionally and then remove from heat and cool completely. 7. Combine sugar and cinnamon for the filling and set aside. 8. Melt the butter in the pan you want to bake the cinnamon rolls in, and then you can use the residue to grease all sides of the pan. 9. Once the dough has proofed, lightly flour a clean dry surface/countertop and roll out the dough to approximately a 16” x 16” square. 10. Leave a 1” edge on one side of the dough free from melted butter and any fillings. This will be the outer edge when you roll the dough up. 11. Brush melted butter on the surface of the dough. Sprinkle the cinnamon sugar mixture evenly on top, then take the spiced peaches and spread them out on top of the cinnamon sugar. 12. Start at the opposite side of the clean edge and roll the dough into a log shape. Take a sharp knife and cut 12 equal rolls. 13. Place the rolls in the pan leaving a bit of space to the edge of the pan. Cover the pan with plastic wrap and a towel, and allow the rolls to proof in a warm dark place for another 2 hours. 14. Pre-heat oven to 350°F. Bake the rolls for 25-30 minutes. 15. Allow the cinnamon rolls to cool for 10-15 minutes and make the icing by combining all the icing ingredients in a small bowl with a hand mixer until smooth. 16. Spread the icing on top of warm cinnamon rolls and serve immediately. Oh my, these recipes really look irresistible. Some were very easy to do too! I know! Just by looking at it it’s making me drool! 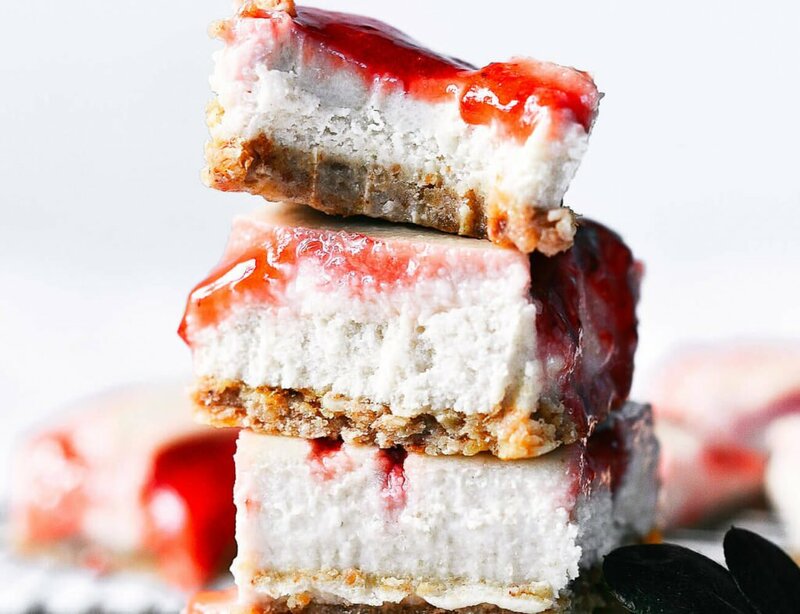 The Strawberry Cheesecake cups look heavenly. When I turned vegan, I didn’t think I could go back to loving pastries. But it’s blogs and websites like this that truly helped me enjoy the vegan lifestyle. The choices are unlimited and you just have to find the right ingredients to help with your cravings. It’s heaven-sent!? The coconut pudding looks a little bland, but I guess some people do like it. Very easy and simple recipe but does the trick. It’s actually very good. You can always add a pinch of cinnamon or something, to kick it up a notch. Great list of recipes! Just reading through it made me want to start baking ASAP.? Love the recipes! Mouth watering and very appetizing too. I’m one of those friends…? The cake pops would have been better for the halloween but pumpkin also tastes nice for christmas. 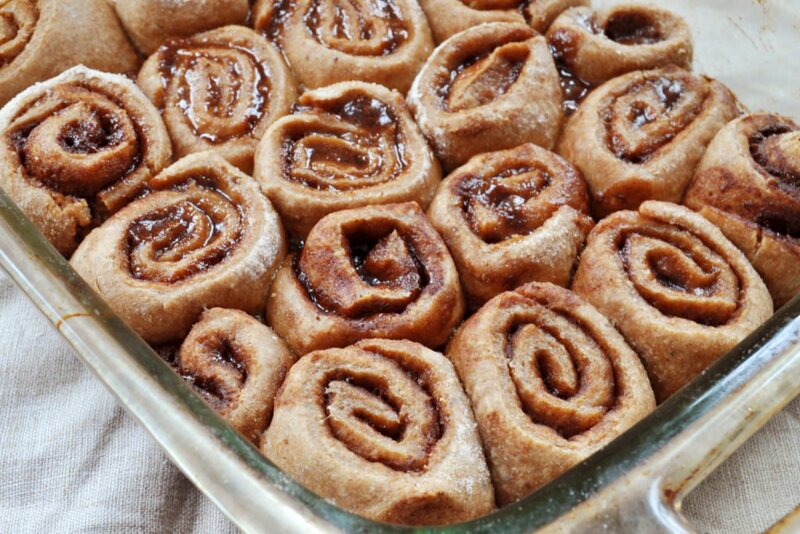 The whiskey cinnamon rolls looks like it could be the center of attention in a gathering! Would love to do this for a family get together. Just make sure the kids don’t eat too much of it! Being healthy nowadays has a lot of secrets untold. Just find the best recipes online and eating won’t be such a guilty pleasure. Hahaha! The magic of the internet and people’s need to be informed with almost everything.